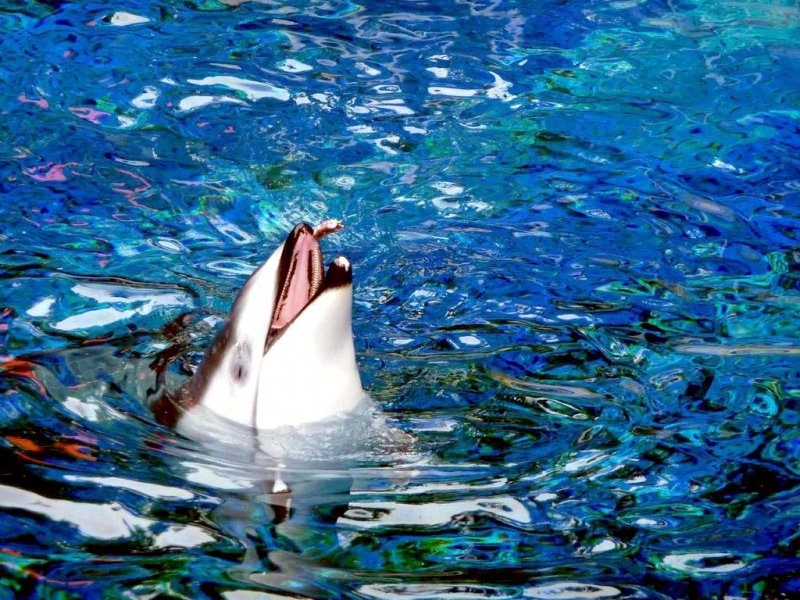 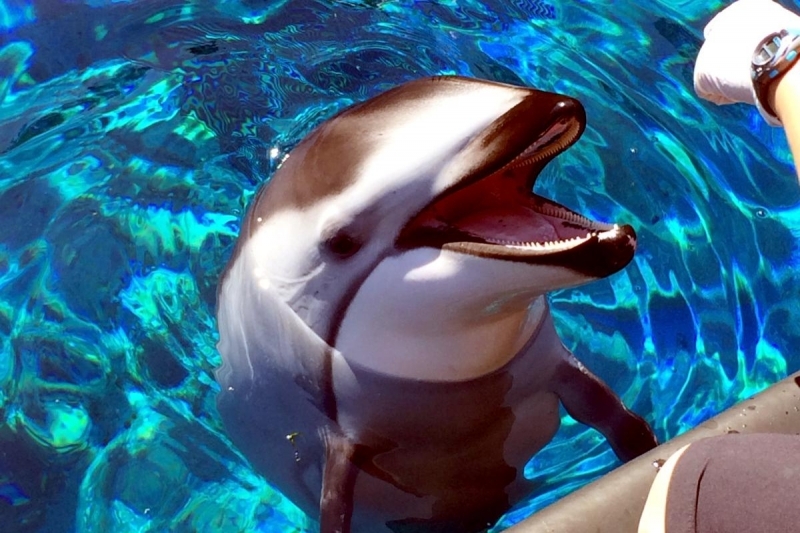 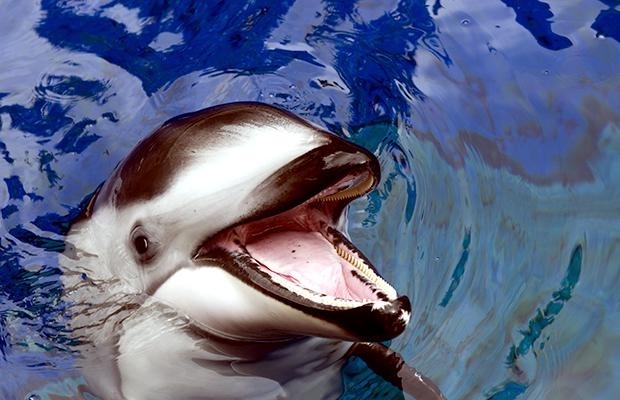 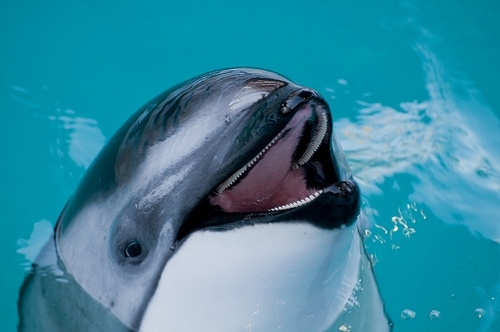 Pacific White-sided Dolphins have short, rounded, thick beaks containing 23-32 small, rounded slightly curved teeth in each side of their upper and lower jaws. 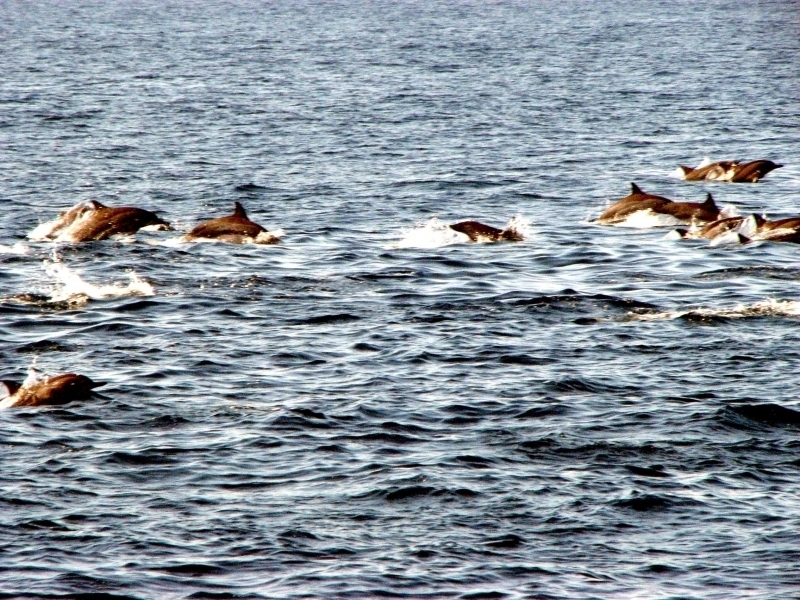 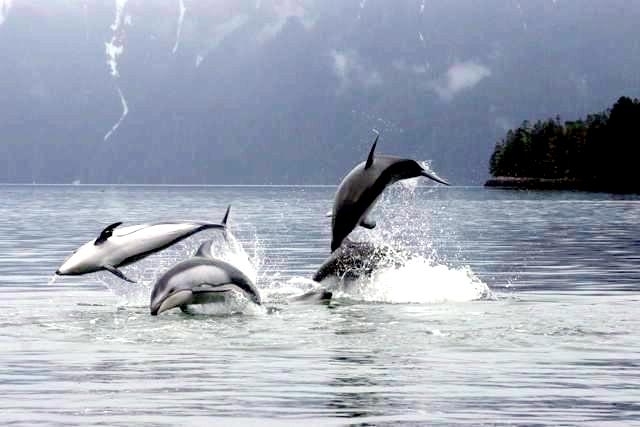 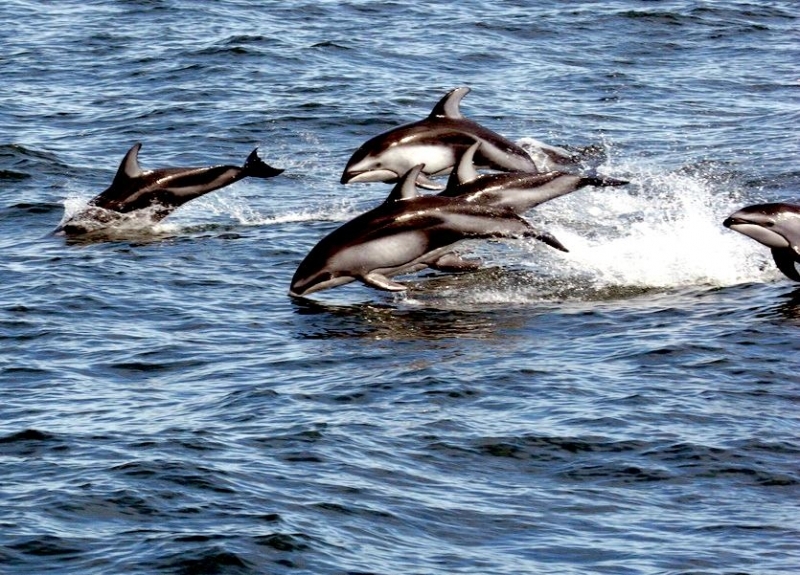 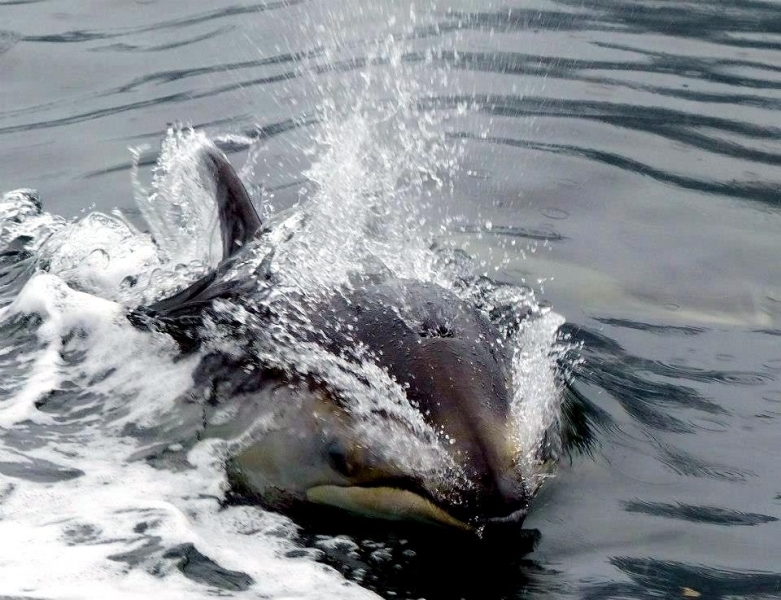 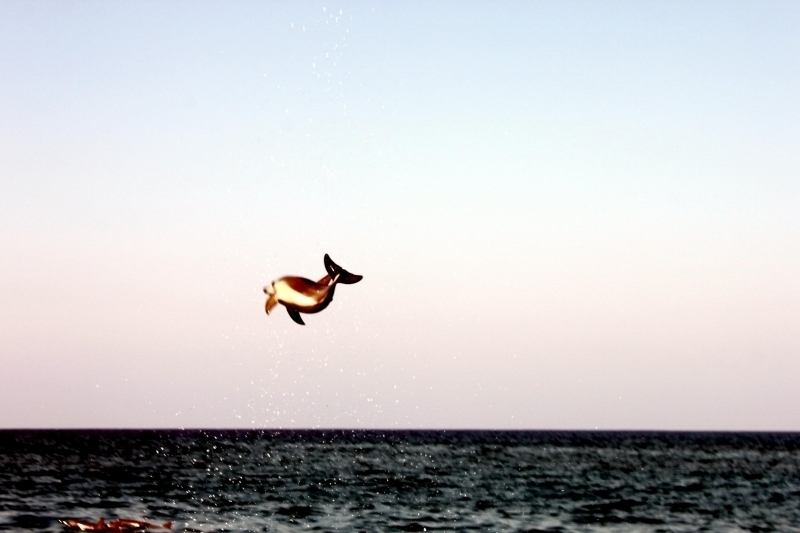 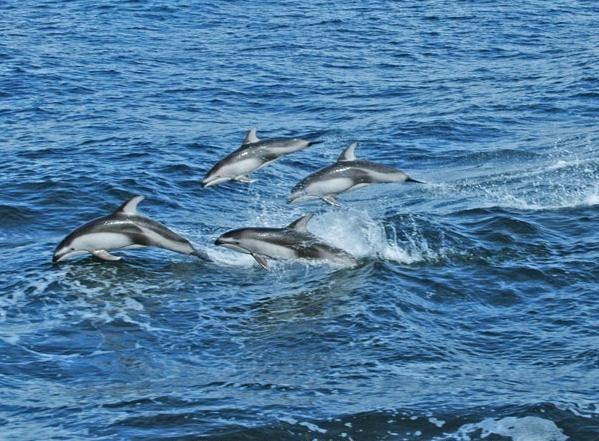 These dolphins are energetic, quite active and are frequently seen leaping, belly flopping & somersaulting. 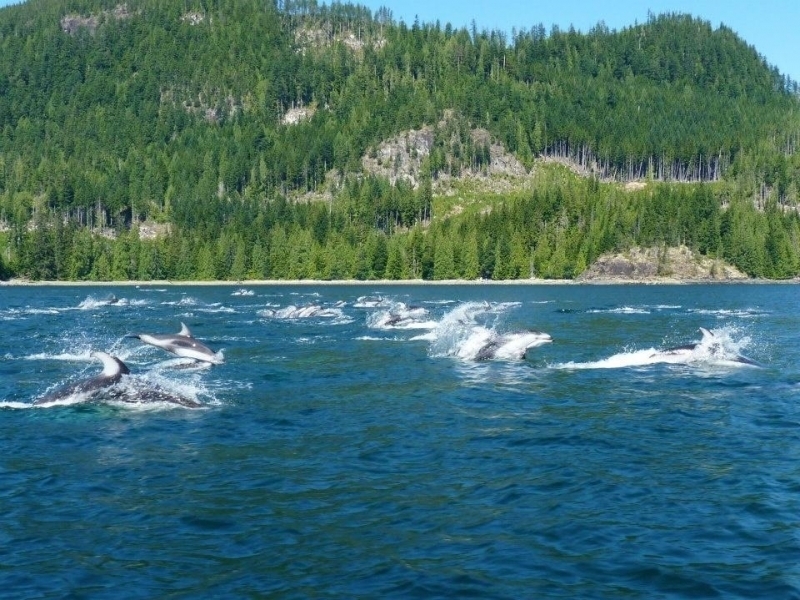 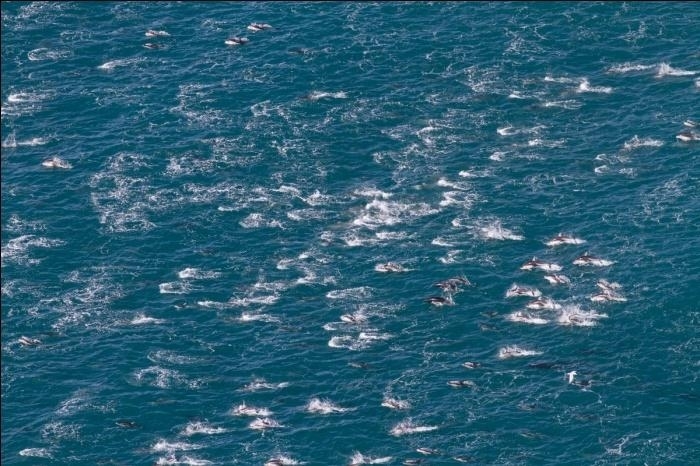 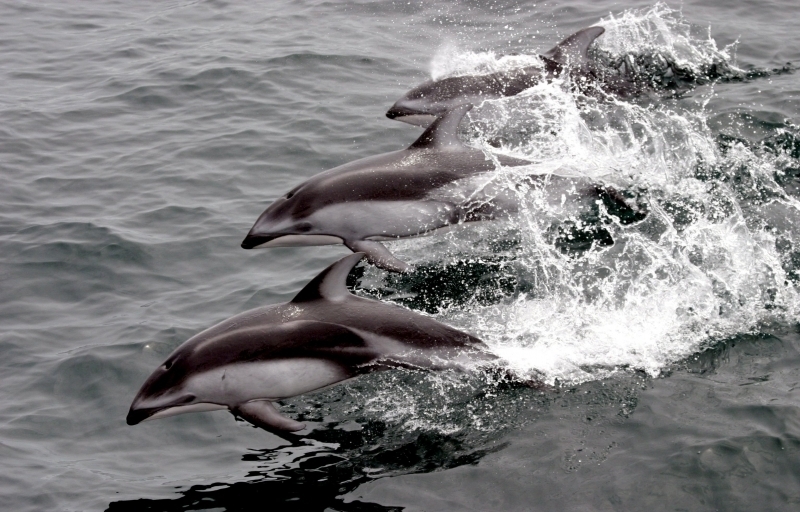 They are strong, fast swimmers and enthusiastic bow riders, often staying with moving vessels for extended periods. 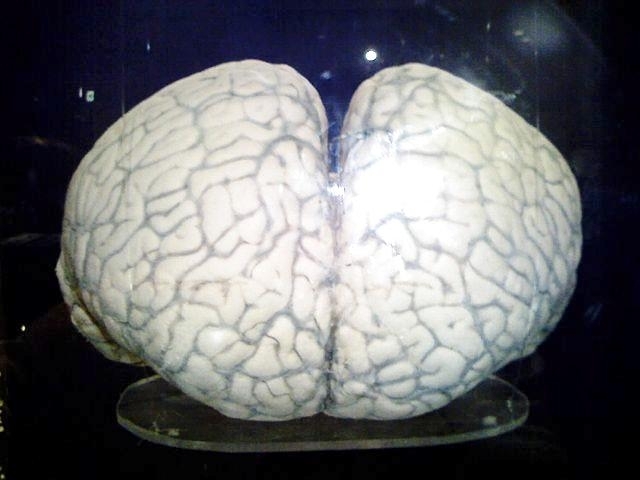 They are attractively marked. 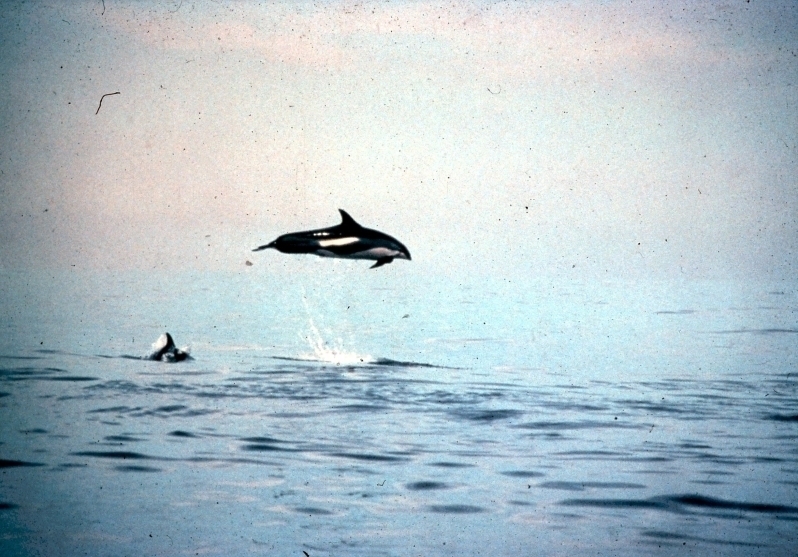 Their backs are black and their sides are light gray with thin, white stripes that extend from above the eye along the sides, widening towards the tail; their belly is white. 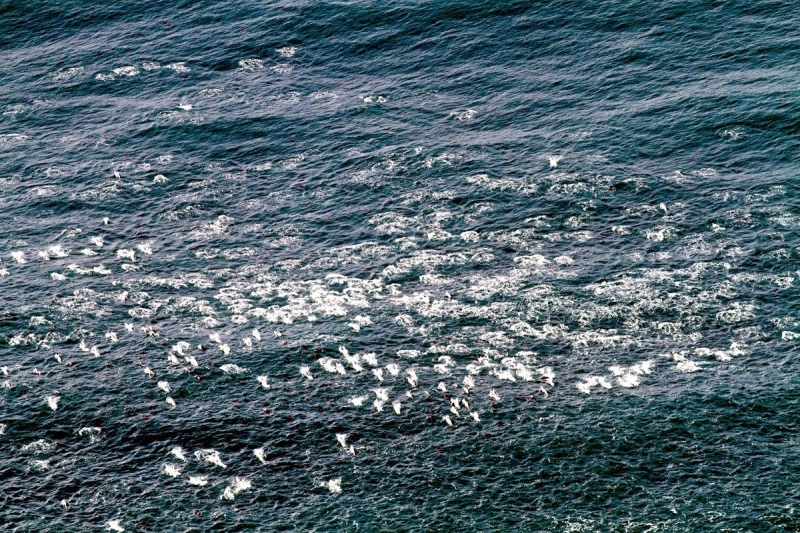 They have black beaks and lips and a black ring around each eye. 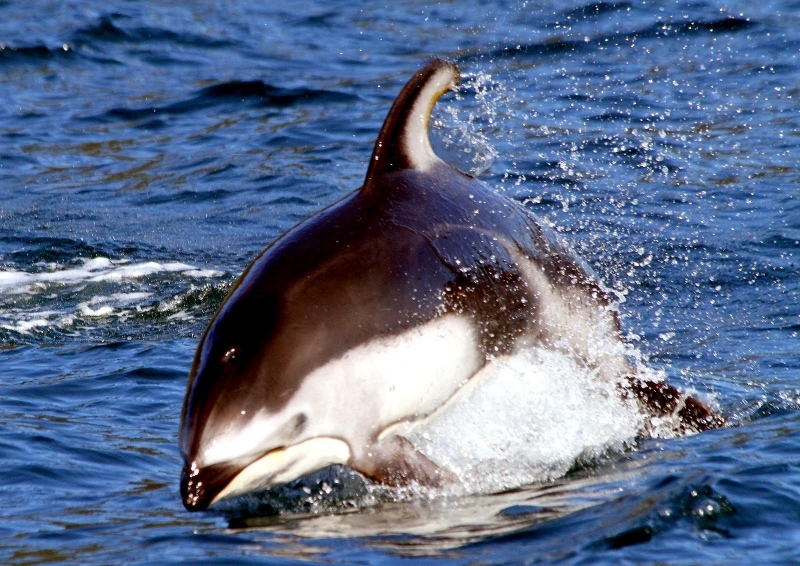 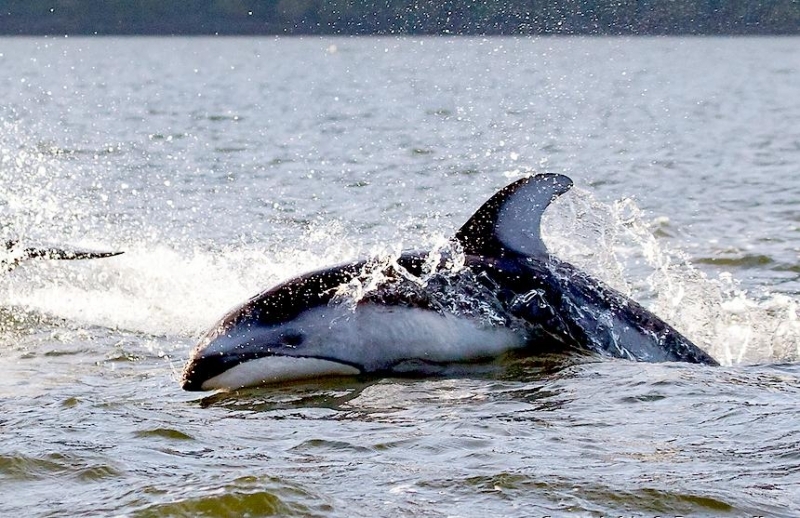 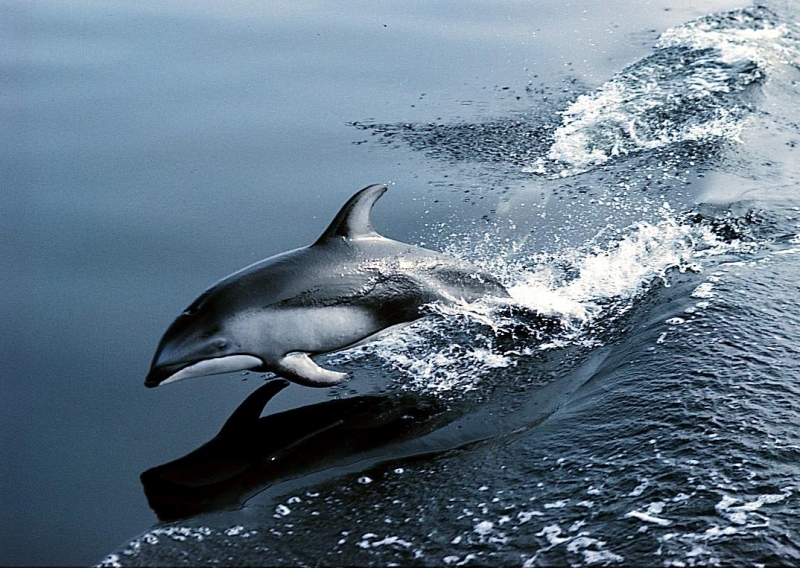 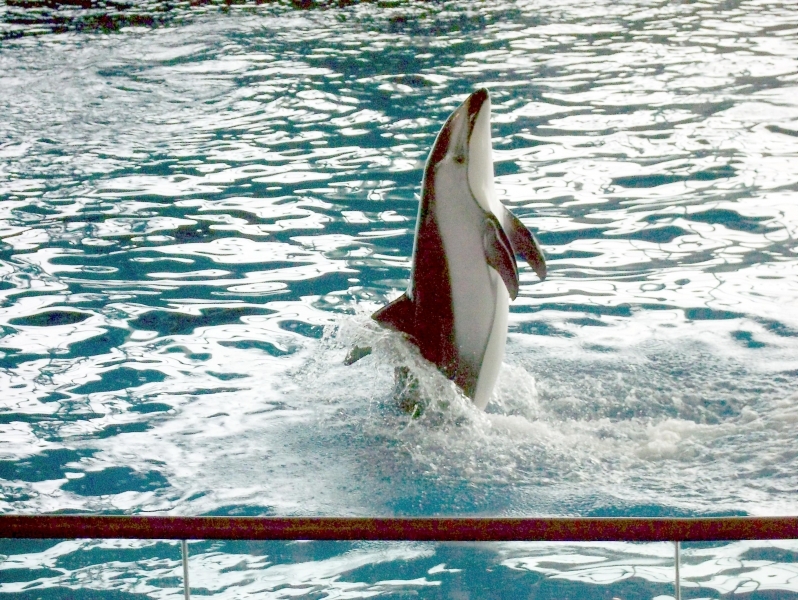 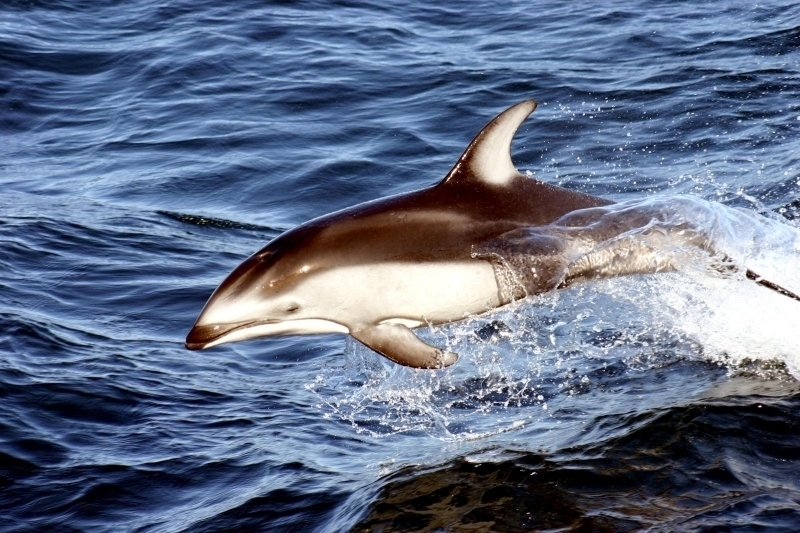 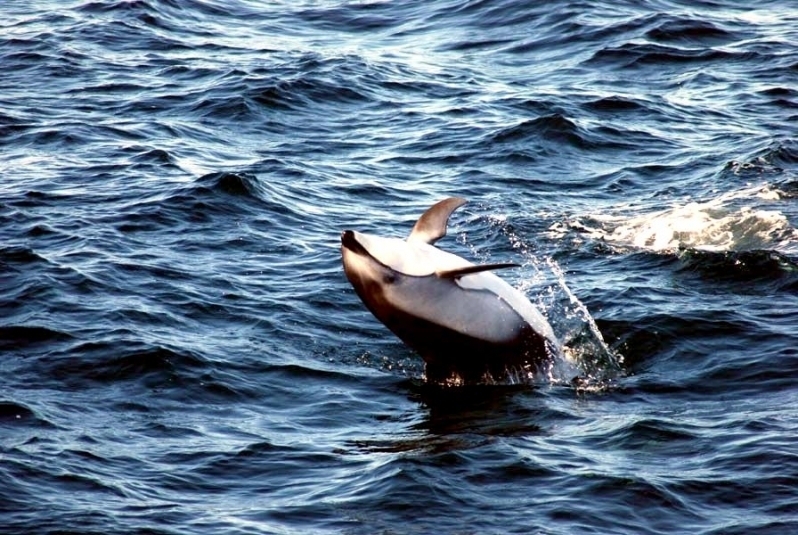 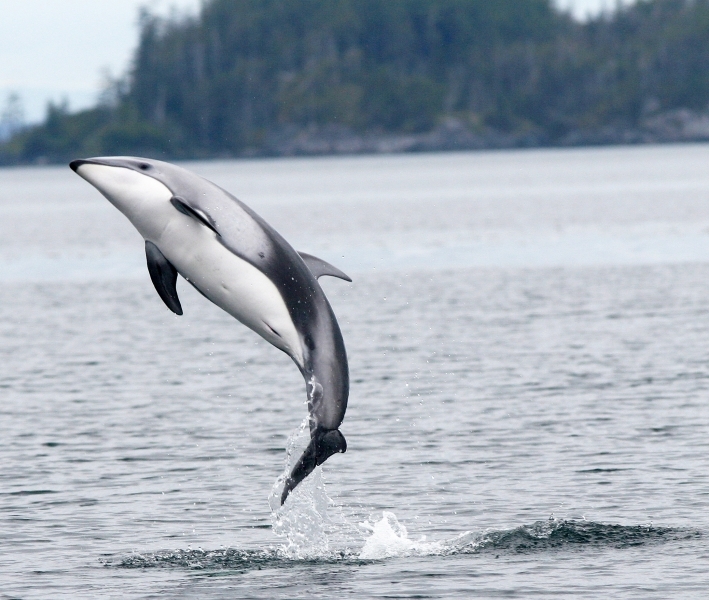 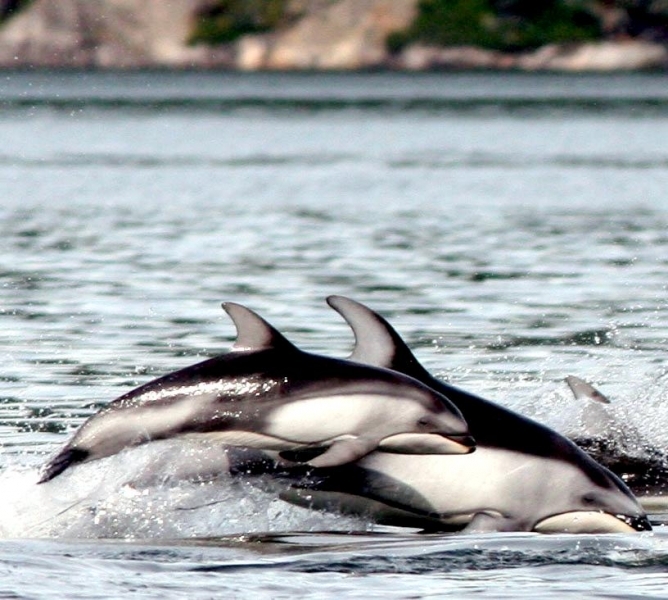 Pacific White-sided Dolphin’s dorsal fins are tall & sharply hooked and are located at the center of their backs. 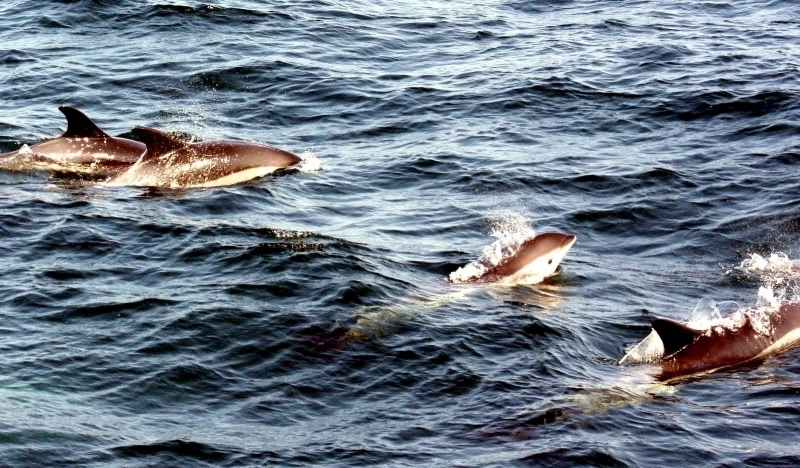 The leading edge is black and the rear portion is light gray. 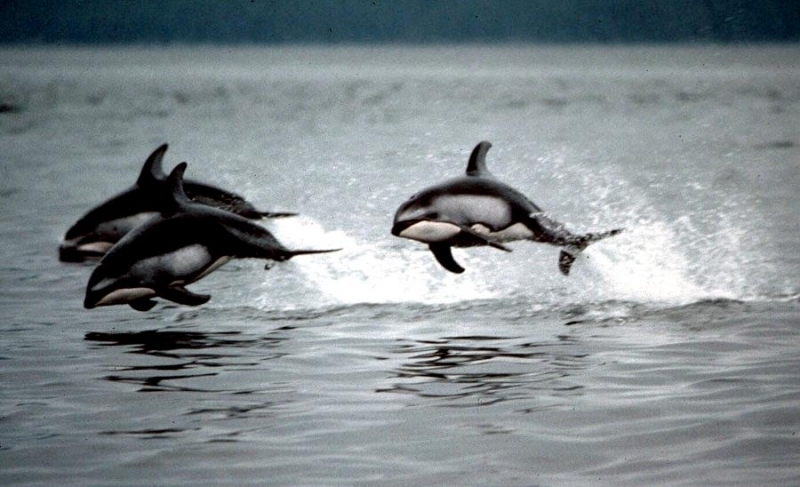 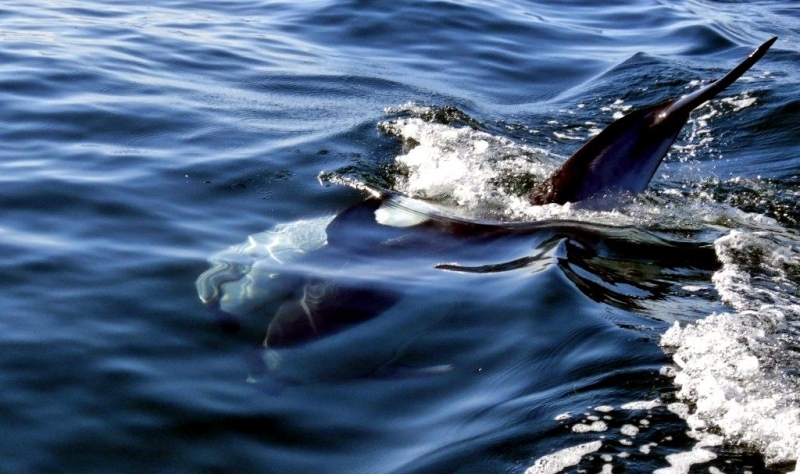 Their flippers are small and curved and rounded at the tips and their flukes (tails) are notched in the center. 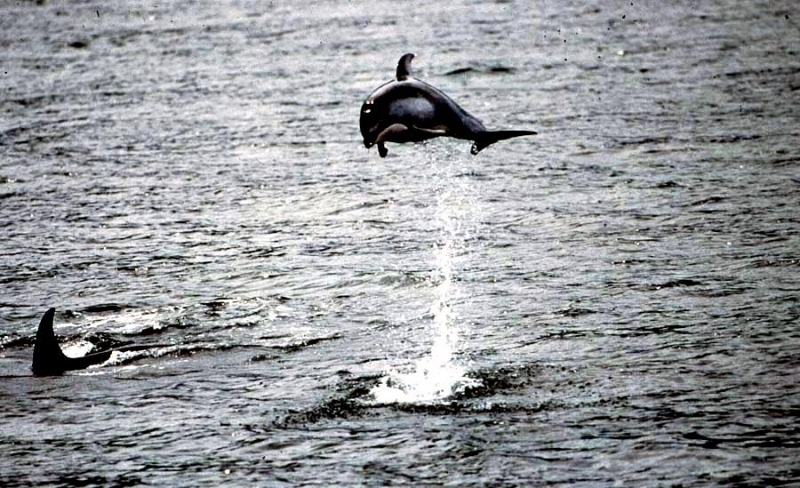 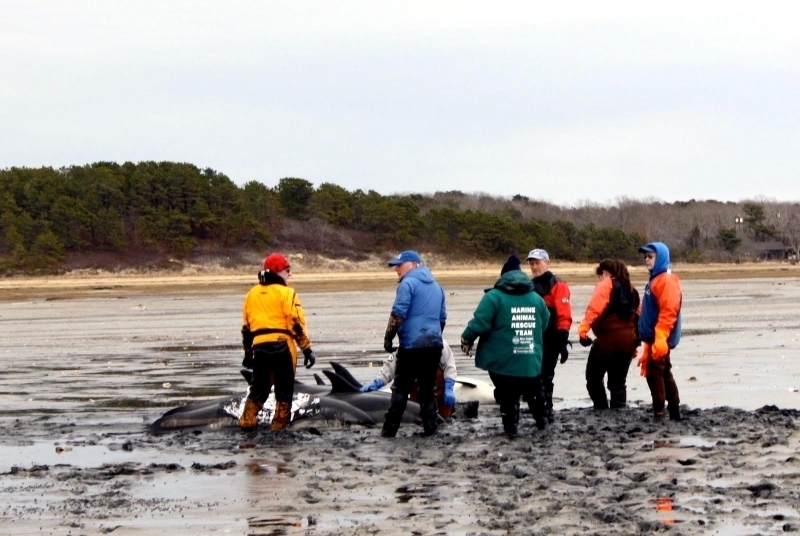 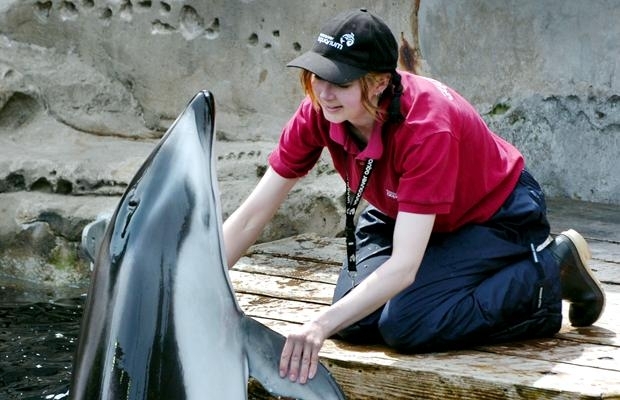 These dolphins reach lengths of 2.1-2.4 meters and can weigh up to 150 kilograms. 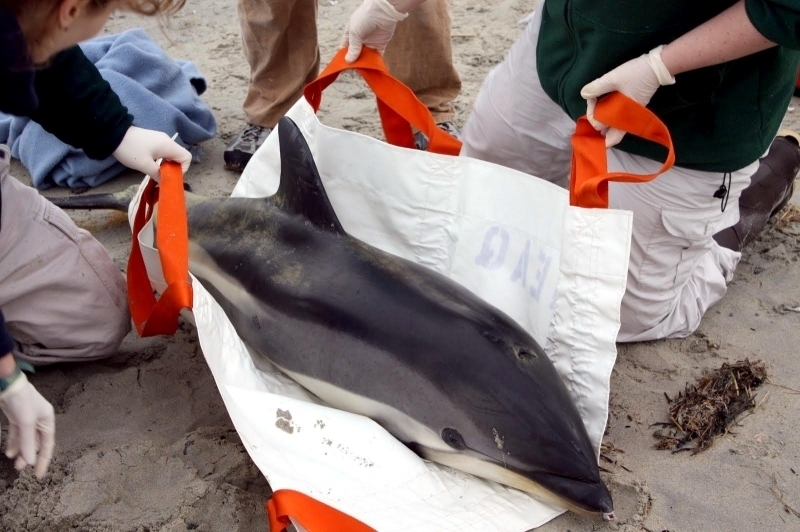 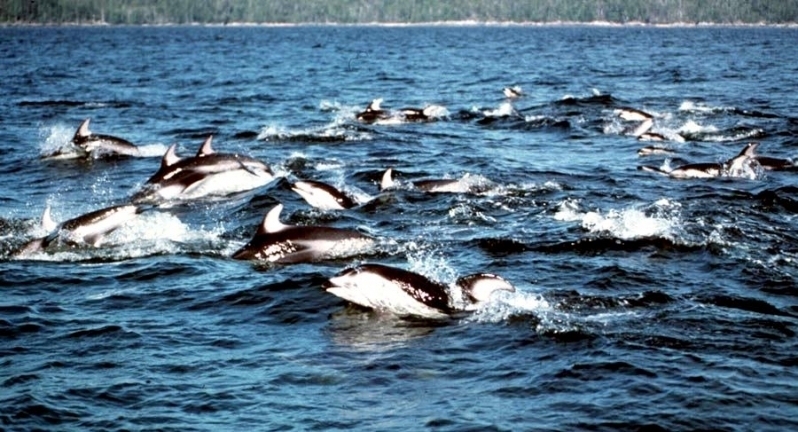 Pacific White-sided Dolphins are often found in large pods of 90-200 animals. 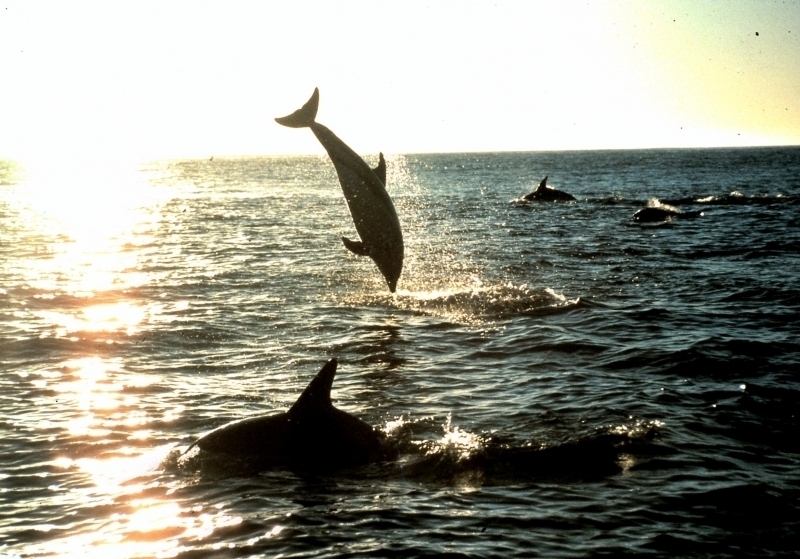 The pods are made up of animals of both sexes and all ages. 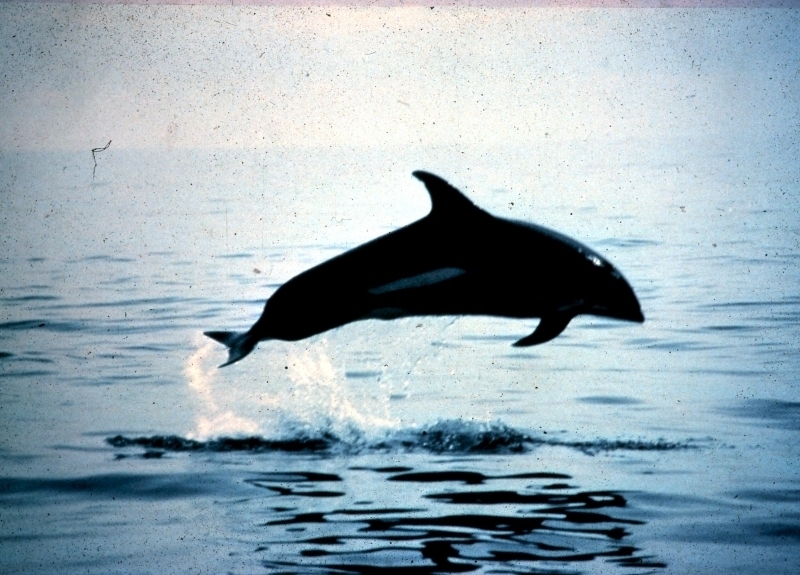 Since they share the same range, they are most commonly seen with Northern Right Whale Dolphins and are often also seen accompanying other dolphins and large whales. 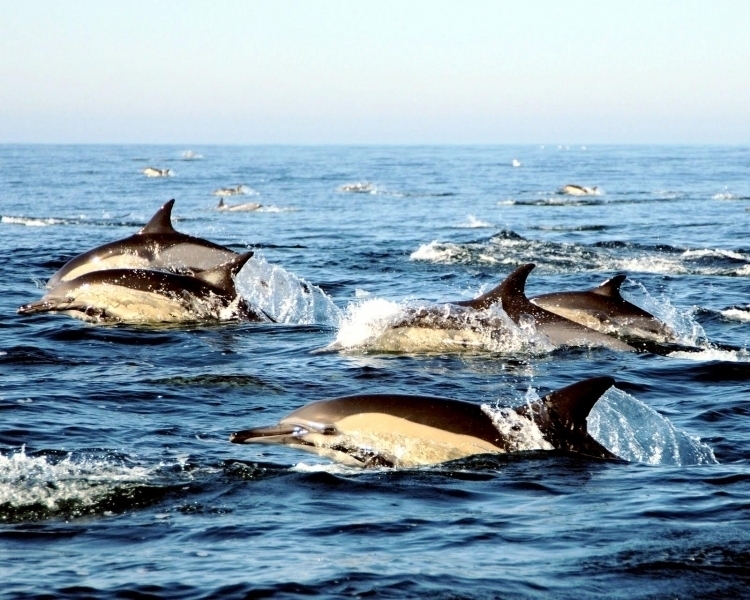 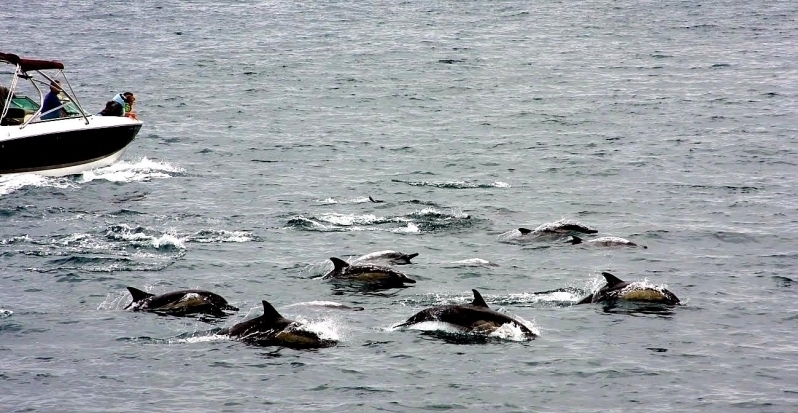 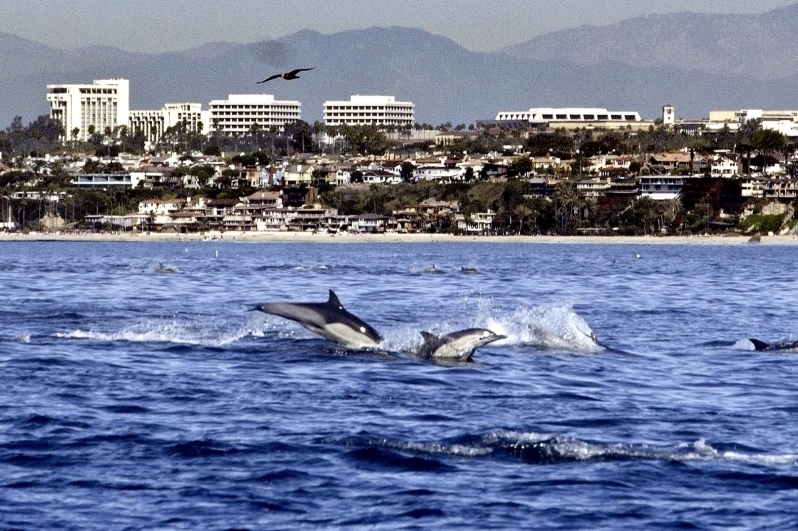 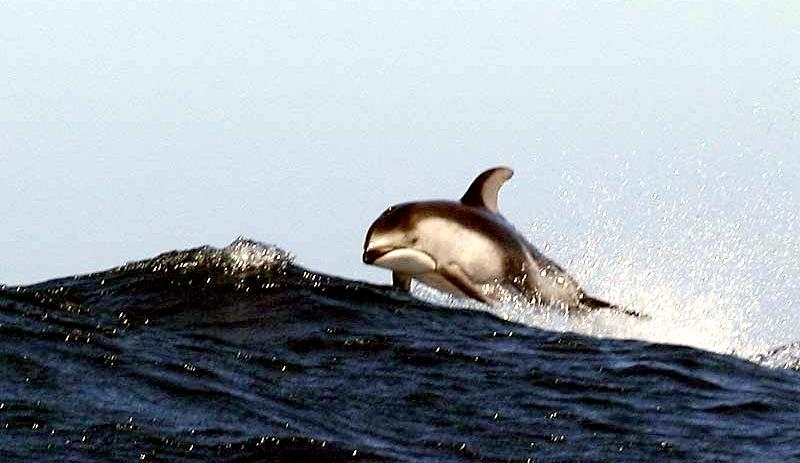 They are considered residents in some parts of their range, notably Monterey Bay and off southern California and northwestern Baja California. 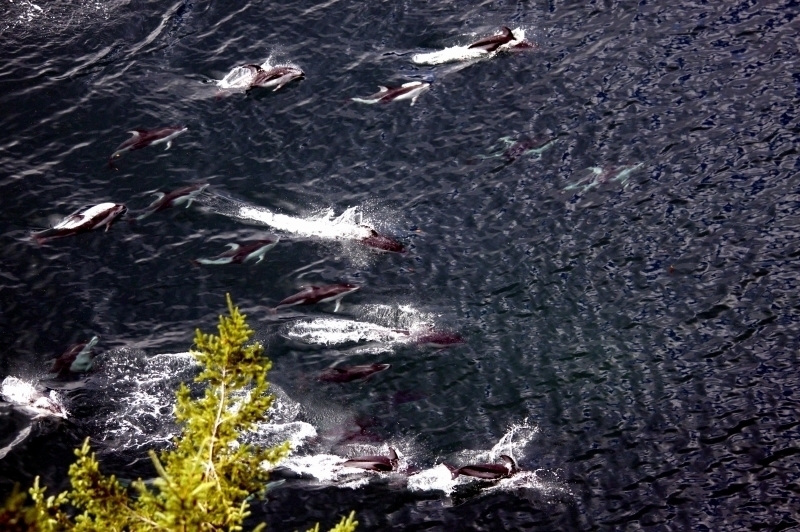 These resident populations are joined by transient groups from other areas from fall to spring. 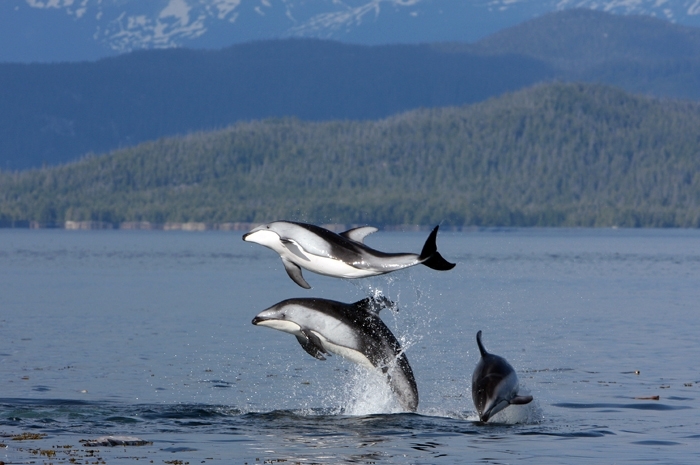 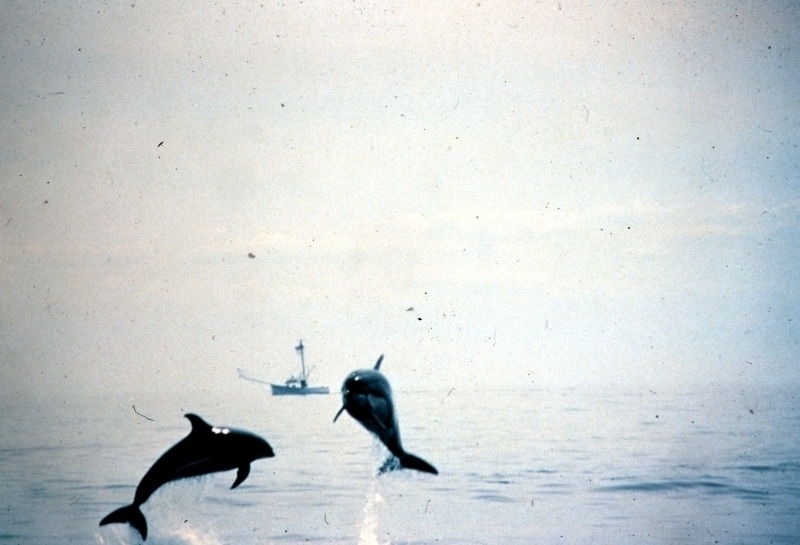 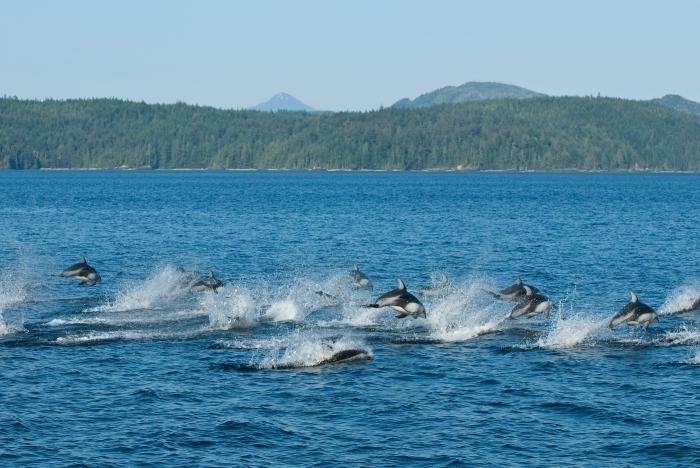 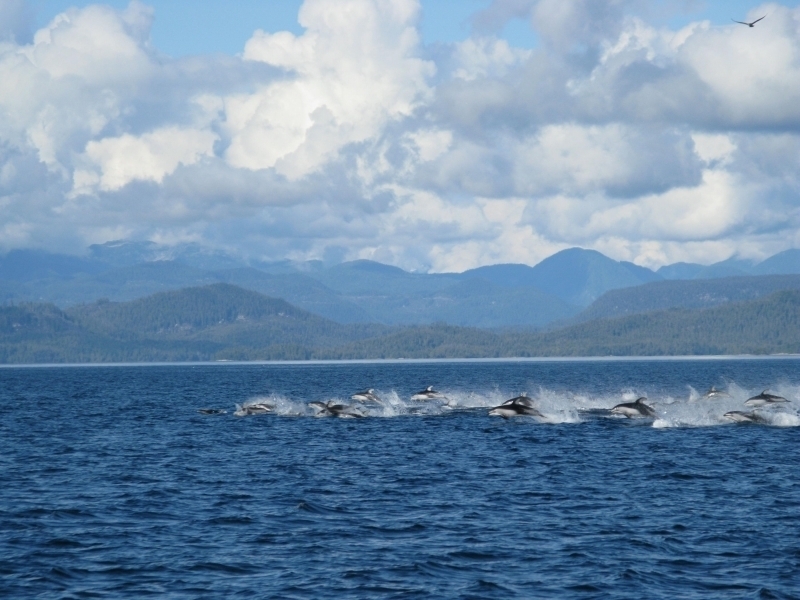 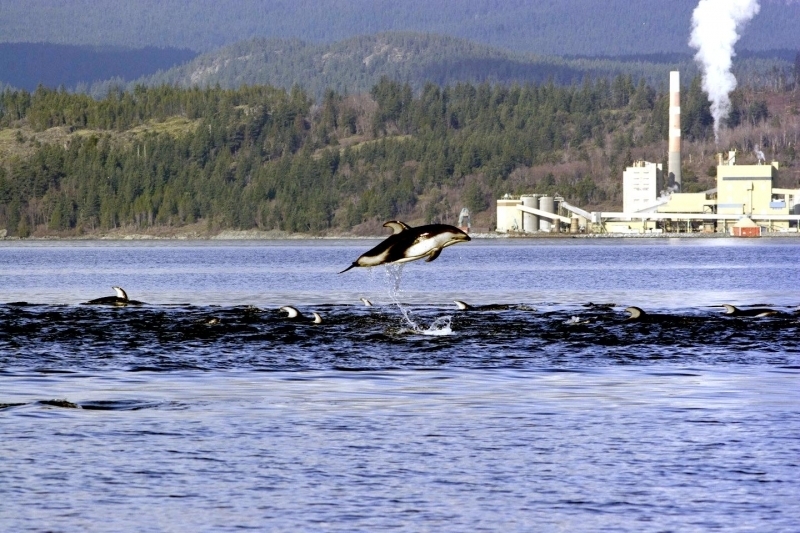 These dolphins inhabit temperate, coastal waters in the North Pacific, avoiding both tropical or Arctic waters. 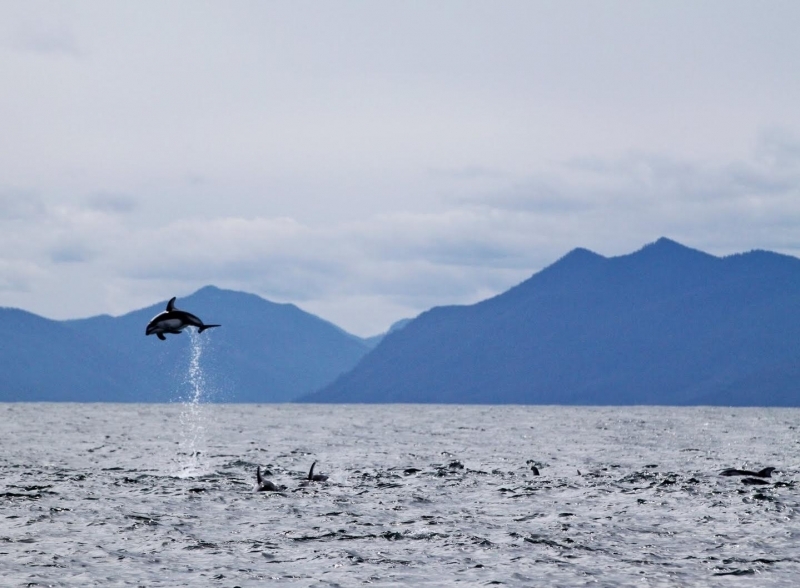 Their range extends from Amchitka Island in the Aleutians, to the Gulf of Alaska south along the coast of North America to the tip of Baja California. 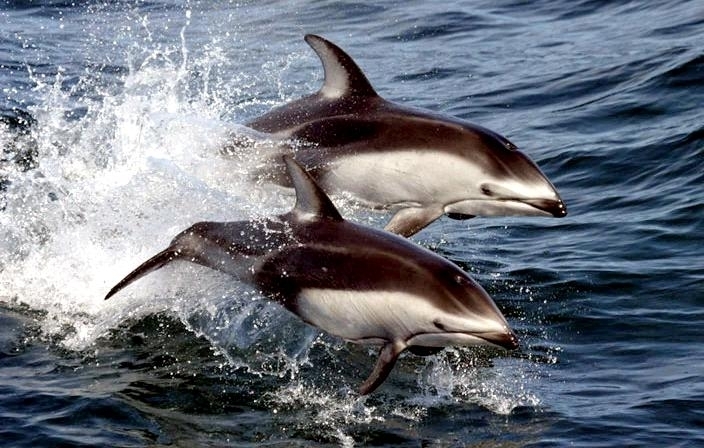 They are also found off the coast of Asia from the Kuril Islands to Japan. 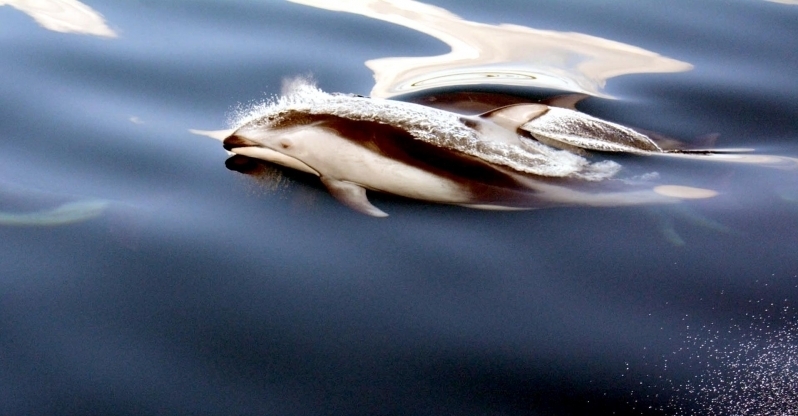 They are abundant in Japanese waters with population estimates of 30,000-50,000 in that area. 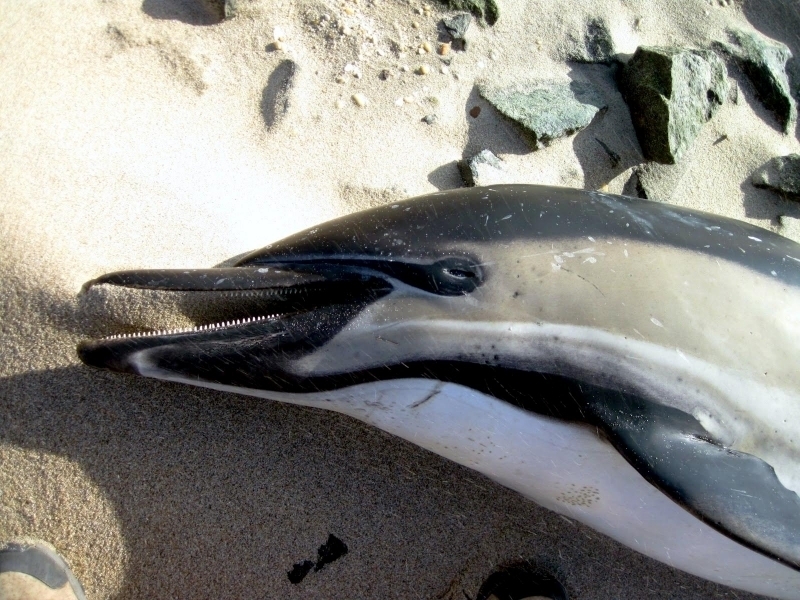 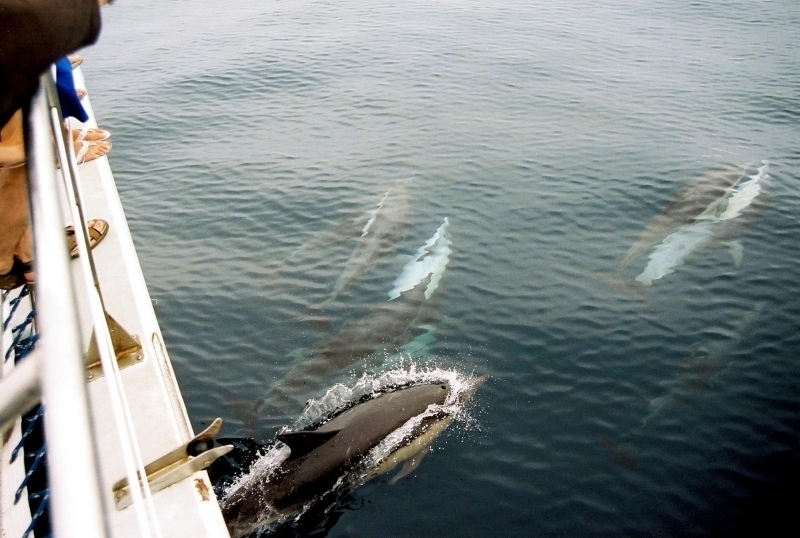 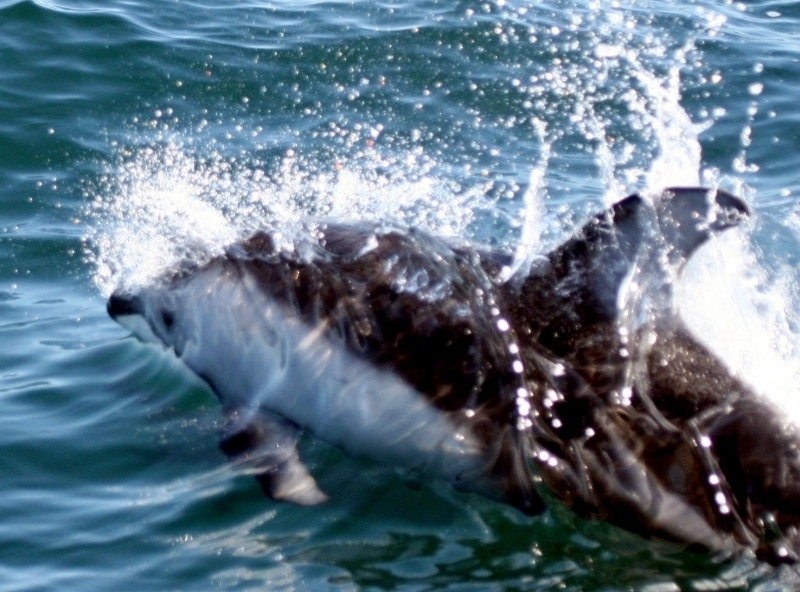 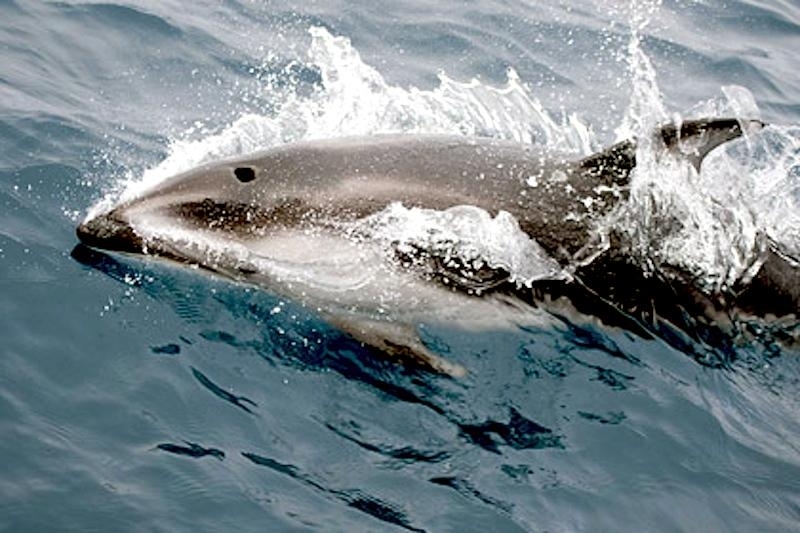 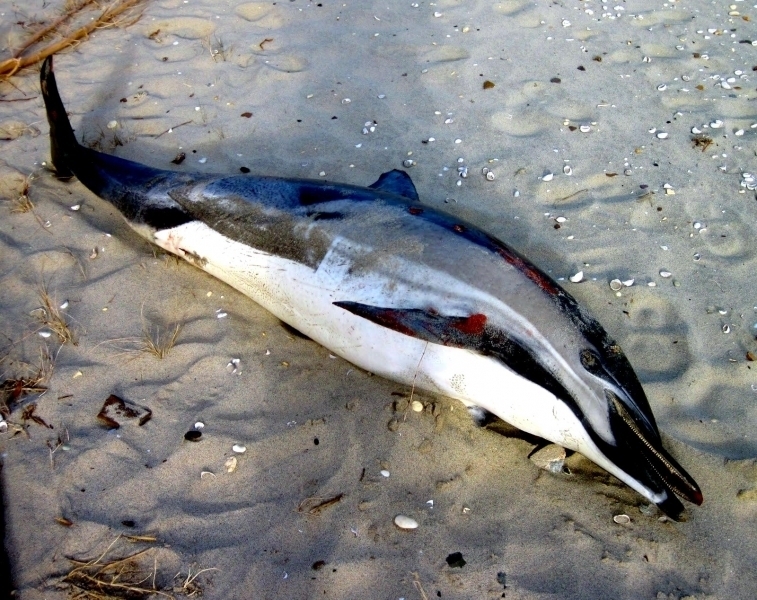 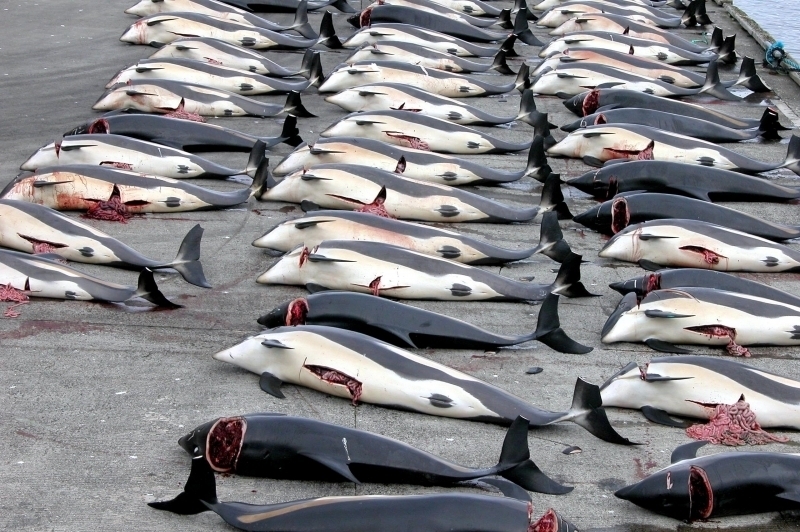 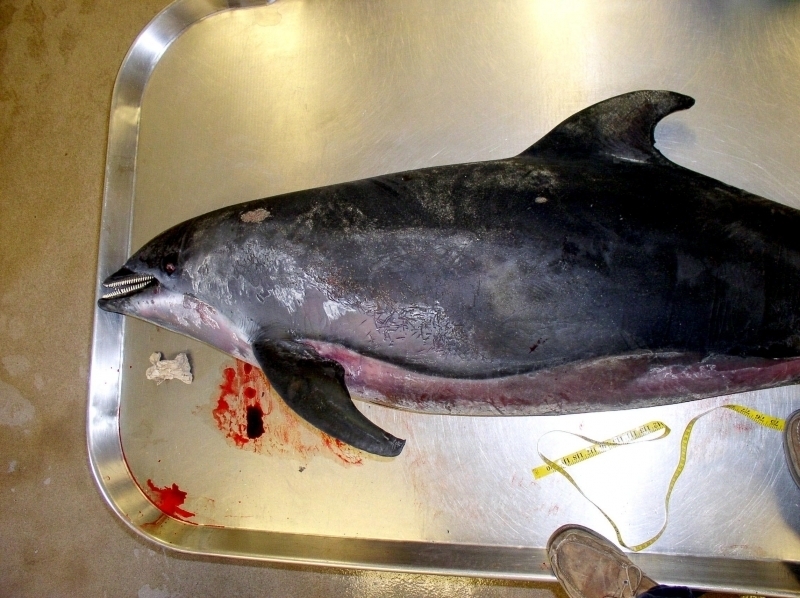 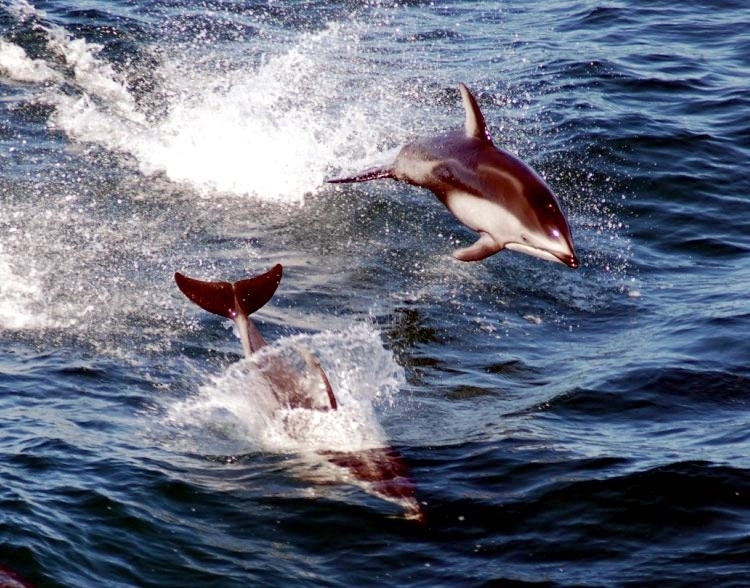 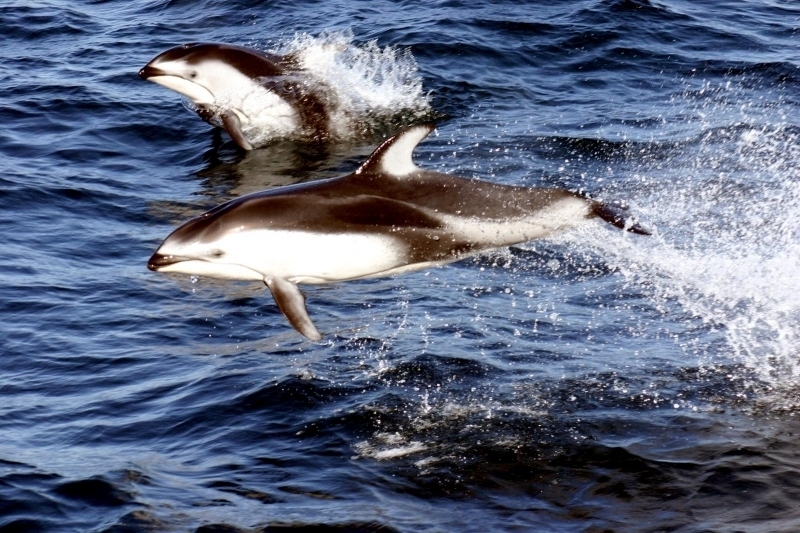 Pacific White-sided Dolphins eat squid and small schooling fishes such as anchovies, herring, sardines and hake. 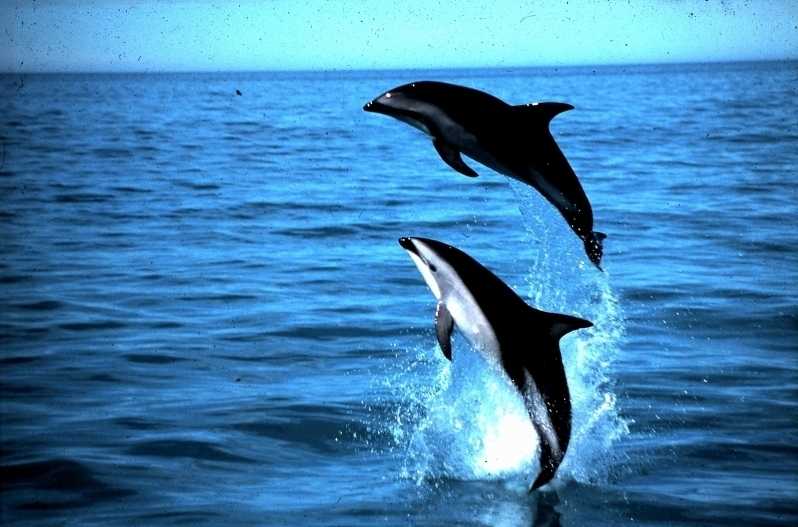 It is believed they feed largely at night. 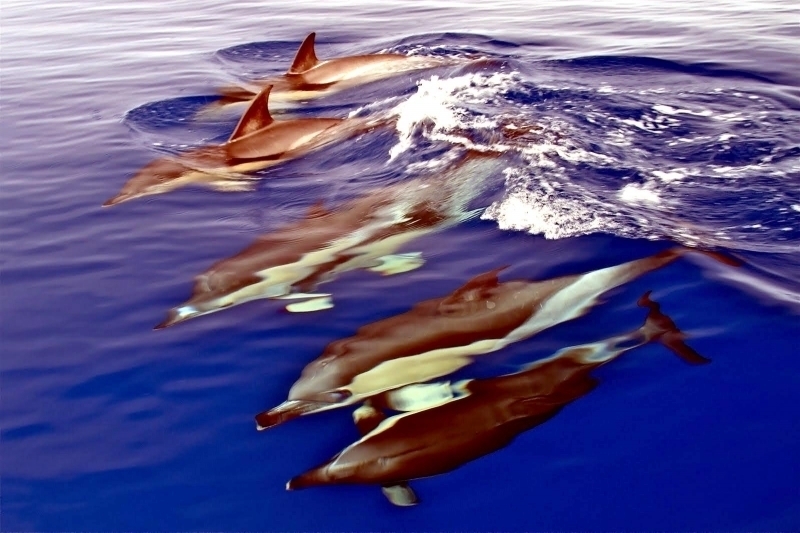 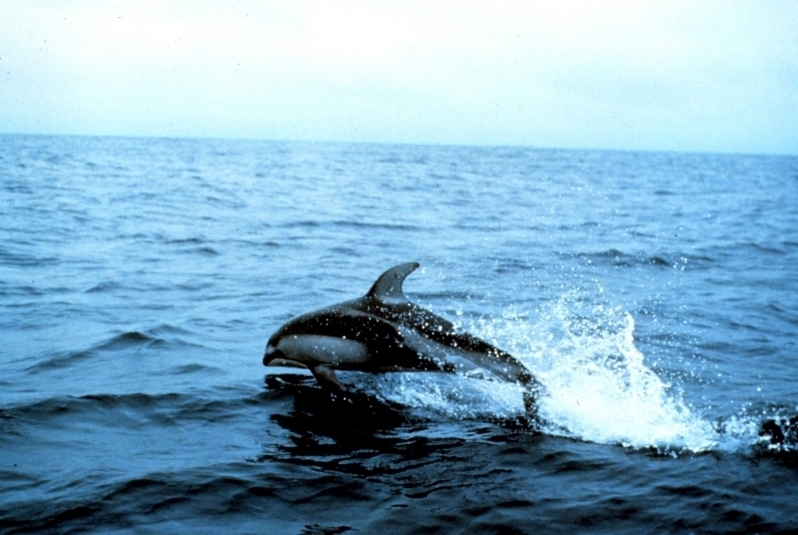 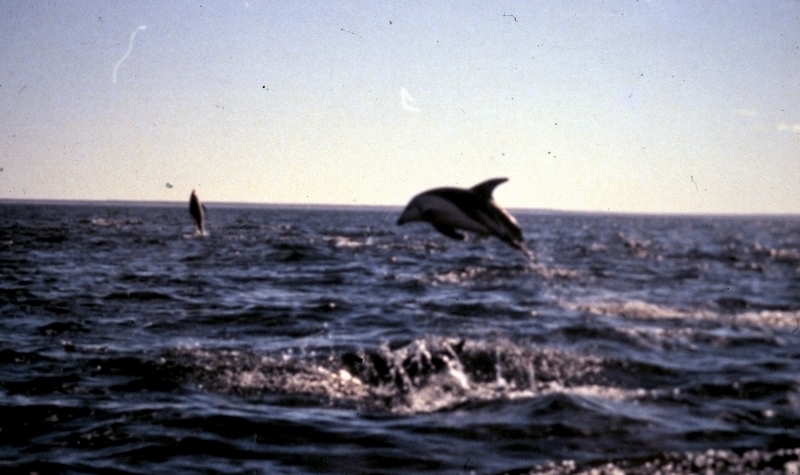 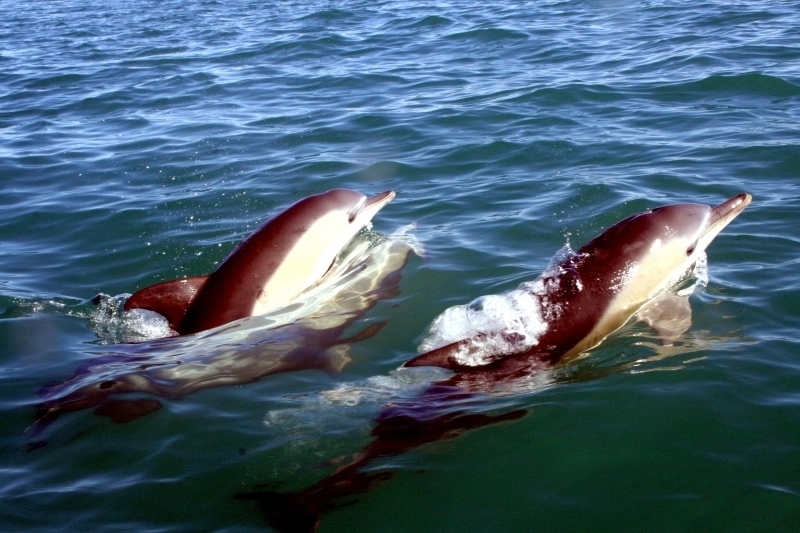 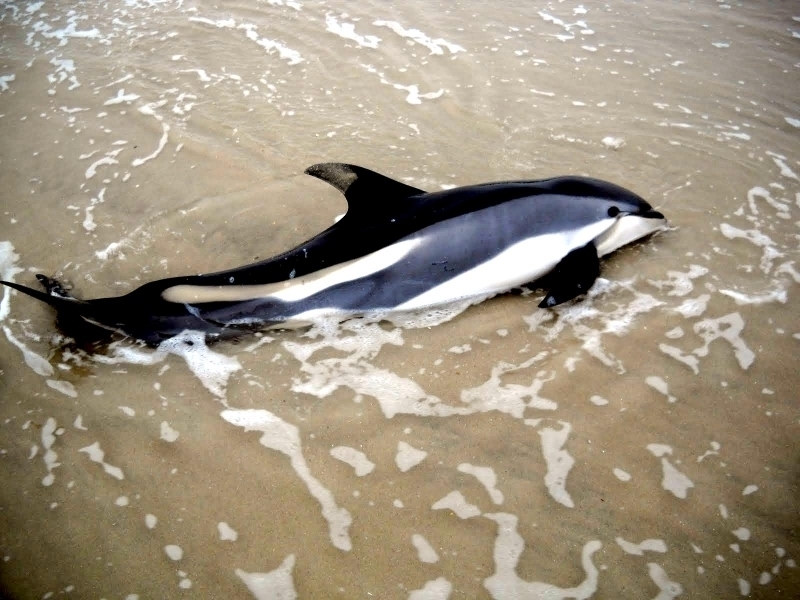 Pacific White-sided Dolphins of both sexes reach sexual maturity when they are 1.8 meters in length, but this can vary according to geographical location. 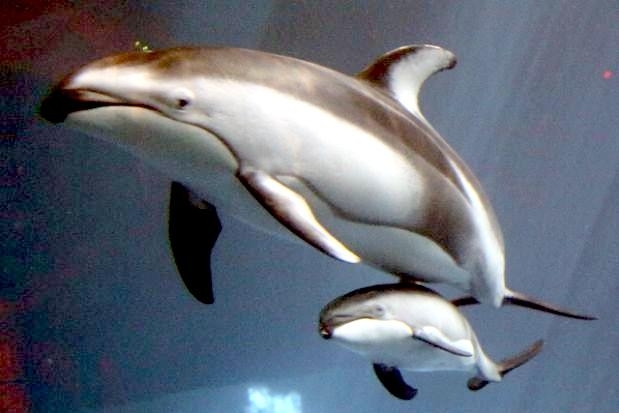 Length at birth is 80-95 centimeters; gestation period is estimated to be 9-12 months.